Although the weather didn't cooperate, cold most of the time due to El-nino our stay was very pleasant. 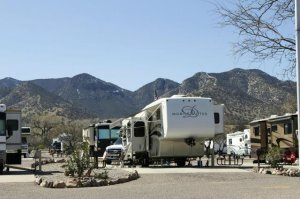 The RV park is very well organized with pull-thru's on concrete pads and the utilities located in the middle of the pad. There are a few trees but didn't seem to interfere with anyone's satellite, but why use satellite when you have cable. The office staff is very, very, did I say very, helpful and pleasant to work with and just to talk with. Although getting off the military reservation is quite a long trip, about 10-15 minutes, but then who's in a hurry after-all we are retired, right? The commissary and exchange are within easy driving distance. Getting on base was easy for our civilian guests, just stop at the main gate, park on the right side of the gate before entering and they will issue a temporary ID card for access to the base. It only took 10 minutes for our 2 friends to get their cards. The laundry is kept up and clean as are the restroom/bathrooms. We will return probably next year or actually this year probably about the middle of January.